This summer, the Infor Scholars handpicked by the Infor Education Alliance Program (EAP) proved to be valuable assets to their teams. Our EAP has consistently placed bright young minds in a position to excel in their respective fields. As a former scholar, I can personally attest that this program empowers, challenges, and grows young individuals who are eager to learn. This spring, I had the opportunity to work as an Infor Scholar with the Corporate Communications Team in the Alpharetta, Georgia, office. 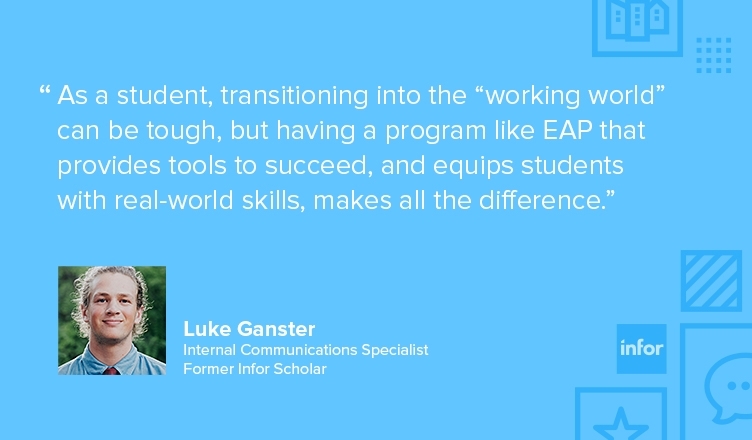 As a student, transitioning into the “working world” can be tough, but having a program like EAP that provides tools to succeed, and equips students with real-world skills, made all the difference. My counterpart on the communications team was Isabella Moylan, who moved from Australia to New York for her Infor Scholar experience. Adapting to American culture and the NYC lifestyle was a challenge in itself. Graduating from the Infor Scholars program this summer are 27 students in 5 cities: Toronto; New York; Alpharetta, Georgia; Austin, Texas; and St. Paul, Minnesota. The scholars contributed in several areas, including development, sales, business innovation, marketing, services, and education. For scholar YaoMing Jiang, participating at the Inforum Hackathon was a major highlight. This event consisted of YaoMing and one other scholar working with 10 high school students on developing functional applications using Infor Mongoose. “My participation in the hackathon has motivated me to continue refining my knowledge so, in the future, I may have the joy of passing it on like I did at the hackathon,” YaoMing said. It is safe to say mentors and students alike benefit from Infor’s EAP, and the students will hopefully go on to be the leaders of tomorrow. As for Isabella Moylan and me, we were hired by Infor as permanent employees and now work full time with the incredible team that mentored us. To find out more, visit the Infor Education Alliance Program page on Infor.com.